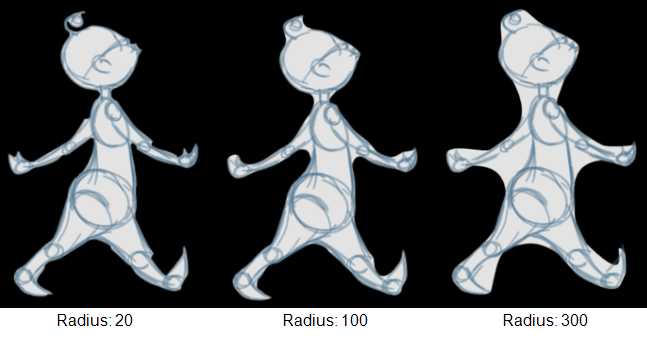 When you are doing rough animation, you may want to send a clip to somebody for feedback or approval before carrying on with your work. If you have several characters in your project that are overlapping, it may be difficult to understand what is going on as you can see though the characters. Toon Boom Animate Pro can generate a matte automatically in the Underlay, or even in the Colour Art layer, and fill all the zones inside your characters making them opaque. This process is fast and easy and allows you to send easy to understand movies. 2. In the Camera or Drawing view, select the drawing you want to create a matte for. 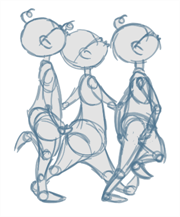 You will also be able to apply the operation to all the drawings in the layer at the same time. 3. In the top menu, select Drawing > Generate Auto-Matte. You can also select the option in the Camera or Drawing view menu under Drawing > Generate Auto-Matte. 4. If you want to create a matte for all the drawings included in your layer, enable the Apply to All Drawings option. 5. Depending on how precise or rough your line is, you will need to increase or decrease the radius value. The lower the value is, the closer to your lines’ contours the matte will be shaped and the higher the value is, the looser the matte will be shaped. 6. In the Source Art drop-down menu, select the layer (Line Art, Colour Art, Underlay or Overlay) you want the matte to be created from. 7. In the Destination Art drop-down menu, select the layer (Line Art, Colour Art, Underlay or Overlay) you want the matte to be created on. 8. If you already have artwork on the destination layer and you want the content to be deleted before the matte is added into it, enable the Clear Destination Art First option. 9. If you want the contour of your lines to be also copied as invisible lines in your matte drawing in case you ever need to keep them for later, enable the Copy Stroke in Destination option. 10. Click on the OK button to validate the operation.